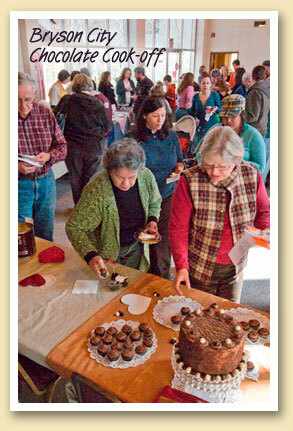 One of the most popular Winter events in Bryson City is the annual Chocolate Cook-off. Now in its 5th year, the February event usually attracts more than a dozen competitors… plus the throng of chocolate lovers who pay up to $6 to sample the entries following the judging. All proceeds benefit the Friends of the Marianna Black Library. Entries are judged on taste, texture, aroma, creativity and aesthetics. Each competitor is required to make at least 150 samples of their creations for the the judges and the public. Cash prizes and trophies are awarded. Bryson City Presbyterian Church, Everett St.
$1 off for Friends of the Marianna Black Library members. Kids under 6 are free. Contact the library for more information at 828-488-3030.